It’s hard to describe what returning to the airline side of TWA was like. Euphoria comes to mind. Less than two weeks after learning I might be able to jump ship at KSC, I was writing tickets and moving Jetways at LAX. My short side trip to the threshold of Space was quite an adventure, but as I reported back for duty in California, it seemed as though I had never left. A clipping from the August 21, 1966 Los Angeles Times chronicles the end of the long strike. The great airline strike, mentioned in the last chapter, had only ended a few weeks before, and there were many interesting tales to hear from my fellow TWAers. Some of our transportation agents were loaned out to American Airlines for part of the work stoppage and they told about the computer crash course they took; we had no computers at the time, at least at the ticket counter and gates. This struck me as odd, inasmuch as American was, for all intents and purposes, a domestic airline with a few odd routes to Canada and Mexico, whereas TWA was worldwide. It would be a few more years before we caught up. Coming in between shift bids, I was assigned to vacation relief, which suited me fine; a little of this, a little of that. By year’s end, another bid was posted and, for the first time, I held day shift. A short time later, Art Roehl, by then a lead agent, told me to turn in my change fund; I was now a permanent gate agent, music to my ears! In December, I attended my first Christmas party in Las Vegas, a weeklong event staged by the city for airline personnel and held at the Sahara Hotel on the Strip. Upon arrival and registration, each participant received a package of goodies, including a free show, a roll of nickels – yes, they had nickel slots on the Strip! – free-drink coupons and a complimentary buffet at the Mint Hotel, downtown. Lavish cocktail parties were hosted by a different airline each evening, and included door prizes such as free passes, flight bags and other souvenirs. The airline room rate at the Sahara was an amazing $8 per night. These were the days when Vegas was not all that busy in the wintertime, and the party week was set up well ahead of the Christmas holidays. During the Christmas party, I ran into my Kennedy Space Center roommate, John Steeb, at Diamon Jim’s Nevada Club in downtown Las Vegas. The Bonanza Air Lines station manger at LAX wrote out unlimited passes for TWA ATO employees upon request, for a small service charge, so flying back and forth to the party was easy; Bonanza had frequent flights between the two cities. In fact, some agents on dayshift flew over after work, spent the evening and came back on the late flight, usually a bit poorer but having had an otherwise inexpensive night out. 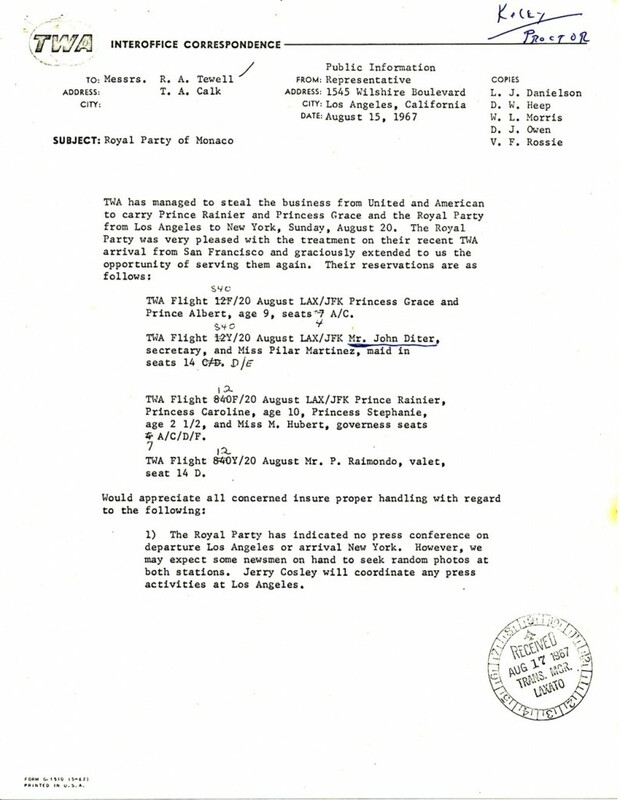 A month later, an opening became available at LAX for the position of Lead Transportation Agent – Commissary, more commonly known as Commissary Supervisor, to replace my old midnight pal, Gary Keller, who had taken the job earlier and was now being promoted to a position at corporate headquarters in New York City. I interviewed but lost out, rightfully so, to fellow TA Steve Ching, who began working for TWA on the ramp and had Commissary experience. Over the years, Steve, Gary and I would cross paths several times and develop close friendships that remain to this day. Disappointed but not surprised after this second unsuccessful promotion attempt, I still had a great job at the ATO. The first Super Bowl game was played on January 15, 1967 in the Los Angeles Coliseum, between the Green Bay Packers and Kansas City Chiefs. Tickets were $12 each, considered outrageously high, and the game did not sell out. As a result it was not telecast in the L.A. area. 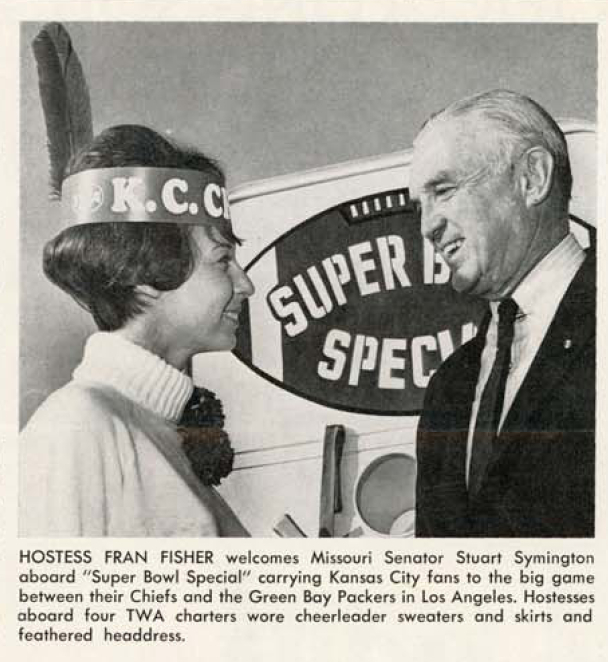 TWA brought 450 Chiefs fans aboard four 707s on one-day charter flights from MKC to LAX, scheduled to arrive in the morning and return after the game. I was off that day, but remember coming in on dayshift the next morning to find the airport fogged in, with passengers stretched out on every available spot in the ticketing building and gate area, sleeping under TWA blankets and resting their heads on our tiny pillows; what a motley looking group! From the January 30, 1967 TWA Skyliner. It turns out LAX was fogged in on Super Bowl morning and after circling the airport, the four Boeings diverted to Ontario, 60 miles to the east, with buses transporting everyone directly to the game. The passengers, including the Missouri Senator Stuart Symington, arrived around half time. During the game, LAX weather improved and the airplanes were ferried from ONT in order to avoid another long bus ride. That great idea went down the toilet when LAX went back under with heavy fog shortly after the transfer. Brought to the airport for their return flights, most of the charter passengers were forced to spend the night in the terminal after nearby hotels filled up with other stranded customers. Expecting to be back in Kansas City that night, no one had overnight bags. RON (remain overnight) kits, usually given to passengers with lost bags, were passed out to provide toothbrushes and razors and the all-night coffee shop was kept busy. As I came in to work, people were lined up at pay phones, calling in sick for work or otherwise providing excuses for not showing up. The flights finally departed at mid-morning. All in all, it wasn’t a great trip for the Chiefs faithful, and oh yes, their team lost to Green Bay, 35-10. Back in the 1960s, long before aircraft featured present-day landing systems, we often had weather issues just described, mostly in the winter. Fog banks rolled in off the Pacific once the sun went down and could provide brief interruptions or keep the field closed all night. If the weather forecast called for such conditions, volunteers were solicited from the TA and ramp service ranks, to go out to Ontario and stand by for possible diversions. TWA had a city ticket office (CTO) at the airport, which was actually a ticket counter. There was minimal ramp equipment and we shared steps and the like with Western and Bonanza, which both had limited, scheduled service at ONT. Usually four or five TAs would drive out in a rental car and played our own version of Russian roulette. We would either sit in the office behind the counter playing poker for hours on end or get hit with multiple diversions and run ourselves ragged. 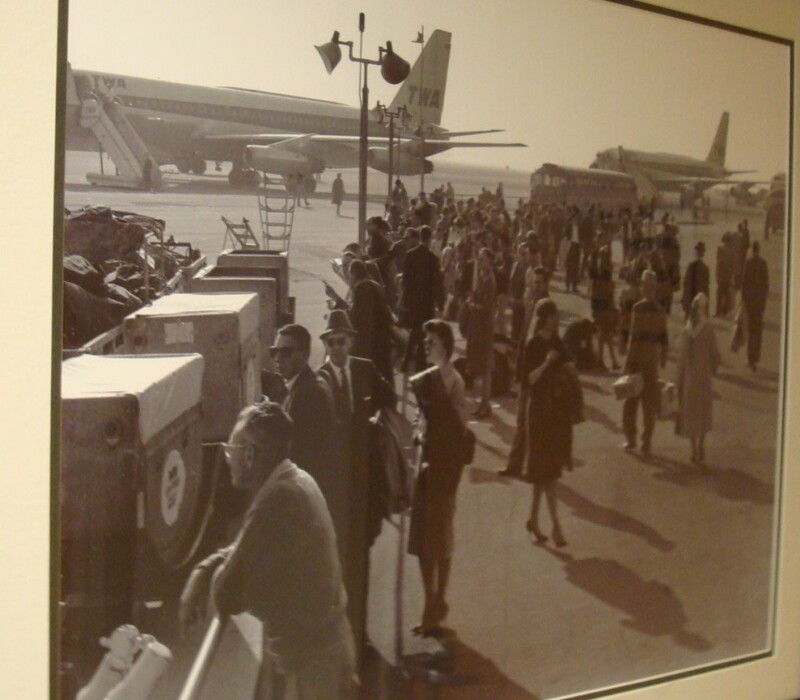 This picture of a fog diversion day at Ontario now hangs in the airport’s terminal lobby. All work rules were abandoned in those situations. The rampers got there ahead of us and had pushed steps up to the airplanes and begun unloading the bags. Then all of us unloaded the bellies and hustled passengers onto buses back to LAX. On that night, we were completely overwhelmed with flights and ran out of ground transportation quickly, so spent time helping the cabin crews tend to their passengers. As I recall, there wasn’t a restaurant or much space in the tiny terminal so it was just as easy to keep people on the airplanes until buses appeared. In some cases, the later buses didn’t show up until after completing an earlier roundtrip shuttle to LAX. We stayed on duty until the next morning with LAX still under limits. Airplanes were fueled and ferried back east in order to maintain the system schedule. One 707 flew was to fly empty all the way back to JFK. Meanwhile, news announcer Chet Huntley had driven out to ONT in a desperate attempt to get back east, and was observed sitting in the lobby with a frustrated look on his face. The ferry flight crew arrived from LAX, complete with hostesses, so we made a quick call to our Planning people and appealed for permission to put Huntley on the plane. At first they balked at the idea, because it would have to change from a ferry to a passenger flight, with incremental costs, but when we told them of the positive publicity we might received, the manger relented. I watched as one of the other TAs walked over and offered Huntley his own private jet to New York. His face lit up with a large grin. There would be no food, but we pulled a few miniatures of his favorite adult beverage from a commissary truck and sent a happy customer on his way. Later in the day, when LAX finally reopened, we were anxious to get back to base. Upon learning that one airplane was going to actually ferry to that airport, we approached the captain; could we hitch a ride? He replied yes, but added that it would be a 3-hour trip as they had too much fuel and would have to burn it off to land within weight limits. By this time, we were on double time and didn’t think that would go over well with our boss, so we went back to the parking lot to pick up the rental car. But surprise; it was gone! Hertz, in need of it for angry customers, had either cut keys or had them available, and rented the vehicle out from under us. Two hours later, we finally did get a replacement; by then, we could have flown back as quickly. By Spring I was occasionally filling in as a Passenger Relations Representative, or PRR, a dream job for me, meeting and greeting VIPs, handling groups, oversales and given authority to take care of problems as they arose. In addition to gaining experience it would give me a better opportunity to bid on future vacancies. In mid-July, two of our PRRs were temporarily assigned to Europe to help with the westbound rush of tourist traffic. 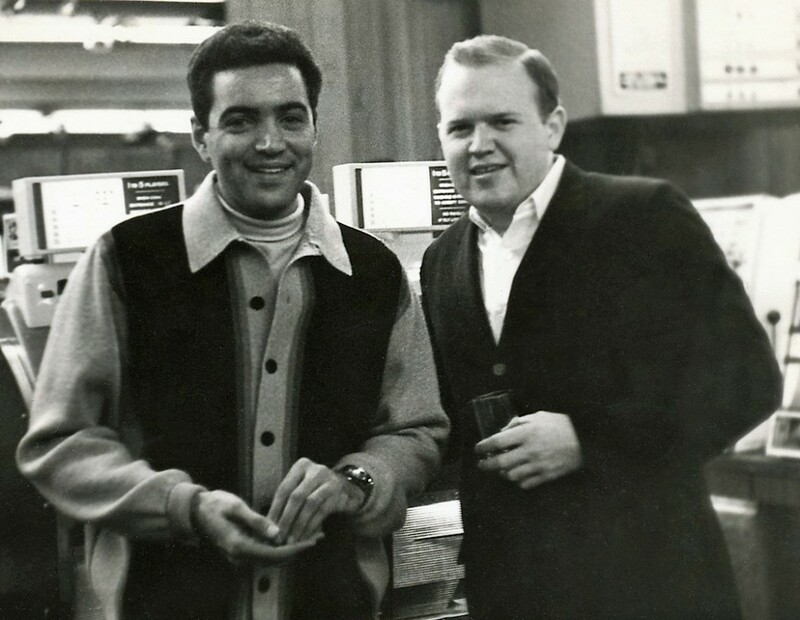 John Carey went to London and Joe Rougeau, a French Canadian by birth, was sent to Paris. Fellow TA Joe Carricato and I were chosen to cover for them, an assignment that lasted until October 25. Nine PRRs covered day and swing shift positions, one each in the ticketing building and Satellite gate area. In addition, a PRR was assigned to the New York nonstop flights; I wound up on dayshift with Mondays and Tuesdays off. J.J. Kelly, Bill Hilton, Mark Starrett, Nick Nitti, Jeff Black, Gary Gunderson and John Kuzma filled out the roster. Little did I know that John and I would work the same positions side by side some eight years after we first met. One day, shortly after assuming my new role, I was paged to a gate where Flight 79 had just arrived from Indianapolis and St Louis. Apparently a passenger had suffered a stroke shortly before landing and an ambulance was en route. A doctor aboard the same flight was tending to the man, who appeared to be confused. “What’s your name?” he asked. The reply caught me off guard: “Virgil Asbury.” I suddenly recognized Mr. Asbury, my woodshop teacher from Oak Park High School 10 years earlier. We had very little time for any communication as the ambulance arrived shortly thereafter and he was transported to nearby Daniel Freeman Hospital in Inglewood. When I checked on him the next day, he was in stable condition and eventually returned to Indiana, where he and his wife had retired, and I was not at the airport when he left. Flight 56, a morning departure, operated with a Convair 880 to Oklahoma City, Tulsa, St Louis and New York-JFK. One morning we witnessed a rare event involving this flight. On liftoff, one of the engines failed, sending a fireball out the tailpipe. After completing the takeoff, Flight 56 circled back for landing and I was at the gate to meet it. A maintenance foreman, walked around the engine and, as he came through the Jetway door from the ramp, said, “Protect the passengers (on anther flight), this one’s cooked!” Although Planning had not yet cancelled the flight, I called my counterpart at American Airlines. They had a 727 departing shortly for OKC and TUL, and held it for us. We scared up a bus in a hurry and ramp-transferred the passengers; I rode over to Satellite 4 with them; in those days 50% load factors were fairly common and the American folks were happy to fill their flight up with TWA customers, although I should add that there was close cooperation between the airlines in the pre-Deregulation days. We helped each other out all the time, especially when flights cancelled. By the time I got back, they were towing the 880 off to our hangar. Both the foreman and pilot told me they had never heard of a CJ-805 engine “coming apart” like that before. Built by General Electric, the power plant was unique to the Convair 880 and a derivative of the military J-79 that powered the B-58 Hustler. 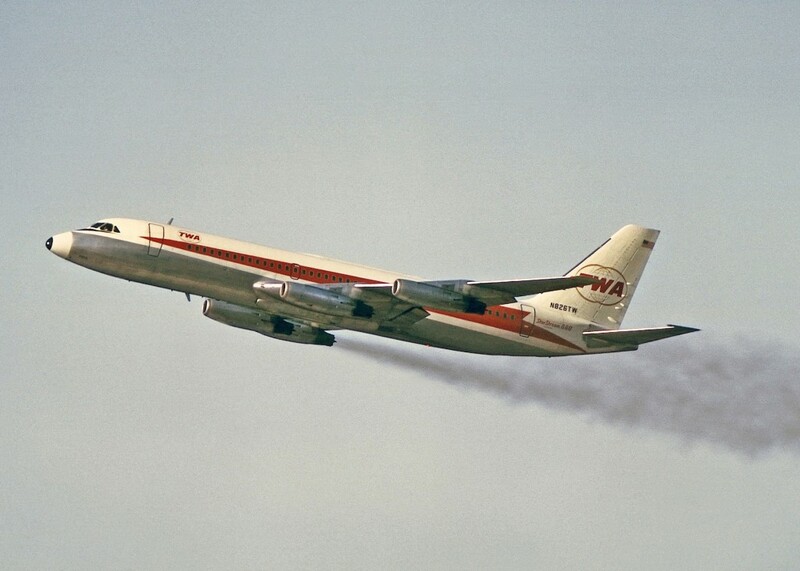 It was such a complicated piece of machinery that TWA actually shipped the engines back to GE for scheduled overhauls rather than do the work in-house. Although great performers, the engines took awhile to get started. We normally began the process 6 or 7 minutes early in order to get the flight out on schedule. 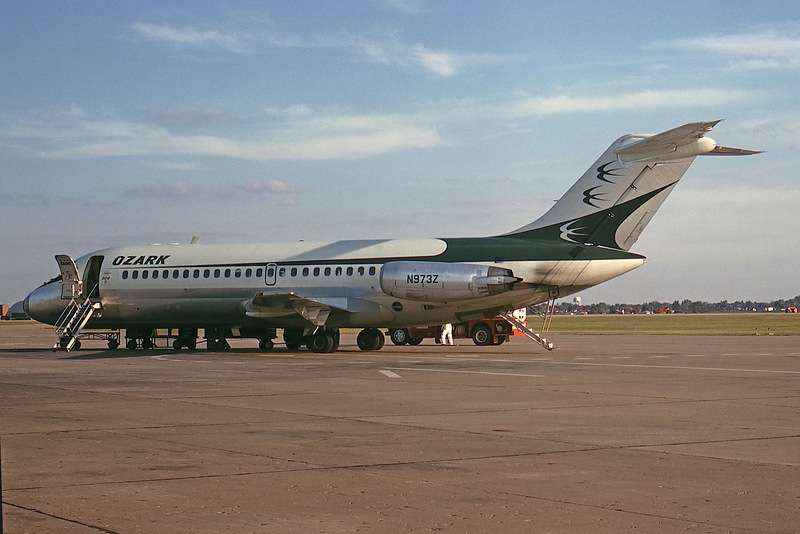 The airplane was given less-than-attractive names, like “the Convair Late Lady,” and “Our Japanese Boeing,” referring to something of lesser quality than the 707, from the early days when Japan exports were considered inferior. My, how times changed! Customers loved the airplane though, with its low cabin noise level and spacious cabin layouts. Unlike the Boeings with adjustable spacing tracks, the passenger seats in Convair’s domestic 880 versions were actually bolted to the floor with a 38-inch pitch between rows throughout the airplane, first class and coach alike. So, as economics dictated increased passenger capacity, more seats were gradually squeezed into the Boeing cabins, but not our Convairs. Only the ratio of first-class to coach seats could be changed. Just a few days after the Flight 56 episode, I found myself being paged to the same flight ASAP. This time it was oversold. The boarding agent told me every seat was filled and they were ready to go, a full 15 minutes before departure time. Unlike today, airlines didn’t send flights out early, but I called down to Ops Supervisor and asked if that applied when every seat was occupied. Sorry, he replied, even then we couldn’t leave ahead of schedule. The agent and I sat on pins and needles for a very long 15 minutes, waiting for more passengers to show up. None did; those Oklahoma folks always showed up early! Flight 56 departed without leaving anyone at the gate. 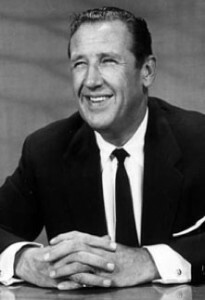 Jerry Cosley, who retired as Vice-President of Corporate Communications with TWA in 1985, was our L.A. Public Information Representative in 1967. He put out the interoffice memo shown here, to detail a bit of a coup accomplished by our sales department. Prince Rainier and Princess Grace of Monaco were on a United States visit and had flown to San Francisco from New York on United and American, then rode TWA down to Los Angeles. Like Steve Allen and Jayne Meadows, they chose to take separate flights and were scheduled to return to New York, again using both American and United, but offered to change their reservations to TWA. I suspect there’s more to that part of story, but I wasn’t privy to it. Even the children were divided up between our flights leaving an hour apart, at 12 noon and 1 p.m. Great care was taken to ensure that everything went smoothly, as the memo states. I was told to stick with the group like glue, along with a host of management people. It all came off without a hitch. Although the press besieged us, I don’t think any of them got into the Ambassador Club, where the Royal Party enjoyed some privacy. Prince Rainier and little Prince Harry left first on Fight 12 at noon, quickly escorted to the gate with little fanfare or notice. It seemed all too easy. And it was. All the excitement occurred an hour later as Princes Grace and her two daughters left the club for the short walk down steps from the mezzanine level and another few feet to the gate. The press crowded around us with flashbulbs popping. Here I was, carrying little Princess Stephanie in my arms, with Princess Caroline holding her mother’s hand. As I recall, there was no security as we know it today, just a whole lot of people moving in a sort of controlled mob. 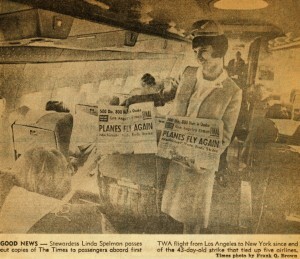 Once the three princesses were safely on board their flight, the press quickly disbursed and things returned to normal. Imagine my disappointment the next morning, when none of the newspaper pictures showed Acting PRR Proctor carrying a princess to her flight! Grown up Princess Stephanie, a far cry from the 2-year-old I carried to her flight. During that summer, I was privileged to meet and greet many celebrities. TWA Sales sent us a daily list of “TWAIPs,” or TWA Important Persons. TWAIP-III status was normally assigned to groups, while movie stars and other public personalities were assigned TWAIP-II. TWAIP-I was usually given to corporate presidents and CEOs. 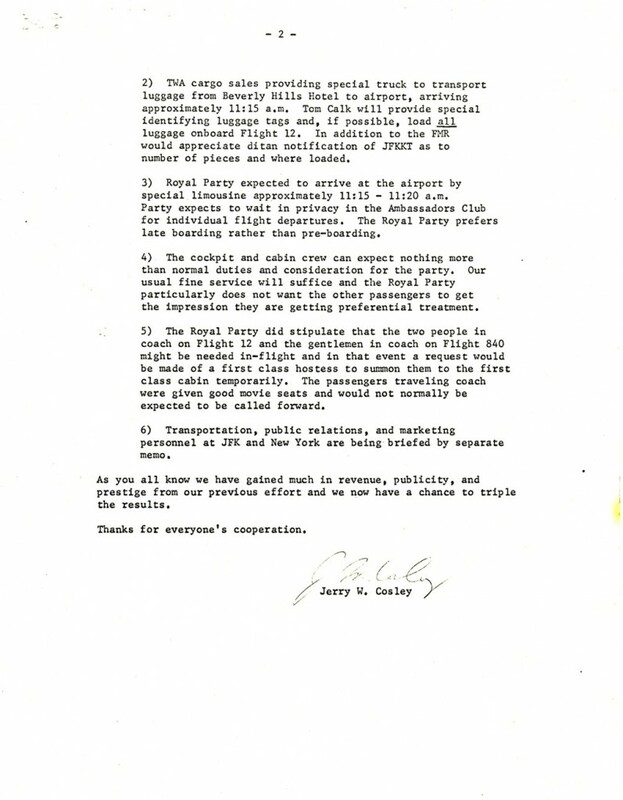 Those select few were even offered private limousine service to and from the airport, compliments of TWA. Among the rare exceptions to these policies was Bob Hope, who received TWAIP-I status. He was heading for New York one day and I stood at curbside with a skycap, ready to greet him. Imagine my surprise when he arrived in a plain sedan with his wife, Delores, who kissed him good-bye and drove off. I received a warm handshake from Bob and took him out to the gate area on a golf cart as he waved to people along the way. In the Ambassador Club, he told me, “I know you’re busy; I can find my way to the gate, Pal!” One thing I found was that, in general, the most famous personalities were the nicest, and Bob Hope was a shining example. Another pleasant surprise was Arthur Godfrey. For some reason, he was not on our TWAIP list, but the Ambassador Club hostess called to tell me he was there. I had always wanted to meet him because years earlier he had taken the full hour (or was it a half-hour?) of his radio show to salute my dad when he became the first airline pilot to retire because of age alone, in 1950. In the Club, I introduced myself and related the story. Arthur smiled broadly and told me, “Sit down and tell me more about your dad.” We talked until it was time for him to head to the gate. What a delightful man. 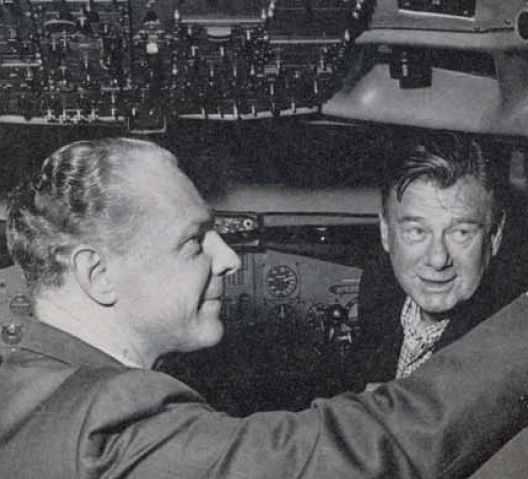 Arthur Godfrey is seen in the picture from the November 11, 1966 TWA Skyliner, being shown a 727 cockpit simulator by Roy Simkins, TWA Staff Vice-President of Training. Other celebrities I crossed paths with that summer included Bing Crosby (who I didn’t recognize without his toupee! ), Del Webb (who was petrified to fly! ), Gregory Peck, Ozzie Nelson, Tony Martin, Cary Grant and Wayne Newton. One afternoon I was instructed to look after Continental Airlines President Robert F. Six and his lovely wife, Audrey Meadows, who were on their way to Washington, D.C. As was the custom, corporate officers from other airlines, along with their spouses, were afforded complimentary, positive-space pass travel on TWA, in first class. However, Flight 60, our 1 p.m. nonstop, was oversold up front and it was possible that we would have to seat them in coach. Bob Six was well-known in the aviation circles for his short temper, and I was, to say the least, apprehensive about how he would react to riding in steerage. As the couple approached the gate, I was struck by the imposing figure of this man, well over 6 feet in height and wearing dark sunglasses. I introduced myself and asked if they would mind waiting until the last minute to board so that we could try our best to accommodate them in first class. Whether it was Audrey’s presence or not we’ll never know, but Six readily agreed and told me, “Take care of your paying customers; we don’t mind waiting.” As luck would have it, two seats together in the front section became available and the Sixes were happy. I was relieved. At summer’s end, just as I was about to return to TA duties, I happened to be at the gate as Walter Alston, manger of the Los Angeles Dodgers, turned his ticket over to the boarding agent. His team had just finished the season in 8th place in the National League after back-to-back World Series appearances, but he managed a smile when I stepped up to say hello. A simple man who wanted no special treatment, Alston managed the Dodgers for 23 years, always with a one-year contract. He was heading home to Oxford, Ohio, riding in coach on Flight 24 to Dayton with a stop in Chicago. I winked at the agent and exchanged his seat in the back for one in first class, which produced an even larger smile. Shaking my hand, he said, simply, “Thanks,” and boarded the flight. Along with work, I enjoyed my pass benefits and never let one expire. In those days, we had to wait five years for a pass to Europe, so I used mine to the East Coast and Florida. Half-fare privileges meant frequent trips up to San Francisco, at $14.18 roundtrip including tax. In October, my childhood pal, Bill Todd, married Janet Tucker in Bradford, Illinois. Sam Givens, whose wedding I attended a year earlier, was best man and several other friends attended as well. One of our sales reps got me a pass on Continental and I took the Proud Bird with the Golden Tail from LAX to Chicago-O’Hare (ORD), then transferred to an Ozark DC-9 down to Peoria. The wedding ceremony was in a small country church on a crossroad between four farms, where a reception followed. I rode back to O’Hare with Bill and Janet, and caught a return Continental flight home. Upon returning from Illinois, I found an interesting job opening posting on the Operations bulletin board. This is the first time I have frequented your web page and to this point I am amazed with the research you made to make this particular publication extraordinary. Wonderful process! I simply couldn’t depart your web site prior to suggesting that I really loved the usual info an individual provide to your guests? I’m gonna be back again regularly in order to check out new posts. I feel quite lucky to have encountered your site and look forward to more cool visits here. I’m really enjoying your site. My dad, Harold Hyne, worked for TWA at LAX from 1949-1985 in maintenance and your web site rekindles many memories about the 60’s onward at LAX. Knew Joe Curtain in BOS. We spent many a late nite waiting for last inbound and I would refresh his coffee the way he liked it and we’d have a couple of laughs. Some said he was a little gruff but not with me. I have your site bookmarked. I have read through it a few times and I enjoy it more each read! I came across your website via airliners.net and I spent my afternoon reading your exploits. It’s very interesting in that my story is very similar in regards to school and my career, in the airline business. I just love reading your stories. Hello there, I found your web site via Google; it’s really informative. this in future. Lots of other people will likely be benefited from your writing. Great website Jon! It appears you and I worked at LAX around the same time. My dad worked in cabin service at AA got me on right after high school (1964) at the wash rack at the AA hangar on the west end of the airport. I loved being around airplanes and a few years later went on the get my pilots license at Hawthorne Field. I loved viewing the old LAX photos especially the DC-7s we used to fly to Ohio every year on dad’s vacation. While still in school, I took a lot of photos from Mike Lymans’s Flight Deck at the old LAX airport. I was there the day the very first AA 707 came in at the end of the concourse. My other favorite spot was at the east end of runway 25R standing on the tracks at Aviation Blvd as the props flew overhead. Somewhere in the basement I still have those old B & W’s. Loved every bit of your story Jon. Thank you for sharing your piece of history in the airline biz. I see many similarities in our career paths, mine having started in 1999 at United. You got to experience the golden age of airlines! I got a short taste of the “good old days” myself; I think the good times ended right around 9/11. Since then it’s a different world – numbers, metrics, rules, regulations… None of that “good judgement” that you mentioned from the old Management Policies & Procedures manual. Again, thanks!